From the pen of bestselling Amish fiction author Jerry Eicher (half a million books sold) comes a charming new series set in Snyder County, Pennsylvania. Debbie Watson is a young Englisha girl who has grown up admiring her Amish friends, the Beiler sisters. As she prepares to graduate from college, Debbie considers making the life-changing decision to convert to the Amish faith and lifestyle. Soon Debbie's presence in the community attracts the attention of two suitors: Alvin Knepp, the youngest son of a poor Amish farmer, to whom Debbie is very much attracted; and Paul Wagler, the more successful and sought-after man, whose constant attention to Debbie reminds her of her old Englisha boyfriend - whom she'd rather forget. Jerry Eicher's many fans and readers of Amish fiction will love this heartwarming new series from a master storyteller. Holding A Tender Heart by Jerry S. Eicher was published by Harvest House in March 2014 and is our 48947th best seller. The ISBN for Holding A Tender Heart is 9780736955119. 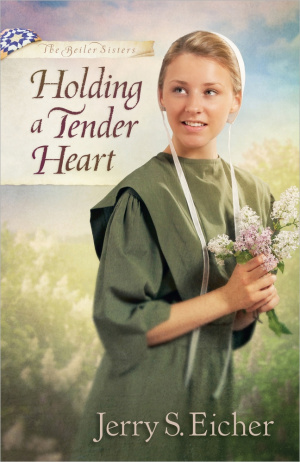 Be the first to review Holding A Tender Heart! Got a question? No problem! Just click here to ask us about Holding A Tender Heart.